information included in this book applies to the designing of bridges with 10 to 90-metre spans in the Dutch landscape. This information will hopefully provide insights into what is involved in the bridge design process. Design guide The ‘Design guide’ specifically focuses on the various choices necessary during the design process and on the different options available to the designer. One by one, it discusses factors like the structure, railings, use of material and load class. Design process This part depicts the entire design process and shows how a design evolves from a first sketch to the final, completed bridge, and what choices were involved along the way. Projects ‘Projects’ details 26 completed projects and the choices that were made for each of them. The focus here is on the interaction between the various bridge parts. Apart from interesting design aspects, it also offers data such as building costs and size. Design guide A bridgeâ&#x20AC;&#x2122;s function is generally known. The same goes for what a bridge essentially looks like. But what elements exactly comprise a bridge? And what does a certain choice of material or a tight budget mean for its design? The Design guide offers you a step-by-step introduction to designing bridges. For each aspect, it shows possibilities and what to be aware of, illustrated with photographs and drawings. What is a bridge? A bridge comprises many different elements, each with its own specific function. The traffic-carrying top surface of a bridge, the wearing surface included. End supports of a bridge. Also called land abutments. The outermost beams of the bridge. Edge beams often have the esthetical function of covering the underlying structure, but can comprise a bridgeâ&#x20AC;&#x2122;s entire structure as well. Smaller bridge part in front of or behind the main span. Usually has a simple structure. Beams Horizontal structural members supporting vertical loads. Placed lengthwise. Camber Horizontal upward curve in a bridge. Cross beams Transversely placed beams or steel elements that help support the deck. Foundation Lowest supporting section of a bridge structure, mainly underground. Railing Barrier on either side of the deck to protect bridge users from falling from the bridge. Supports Columns or piers supporting the bridge. There are many types of bridges. They are most commonly divided according to the structural principles on which they are based. Slab Bridge Structure comprises a slab, supported at its ends. Usually made of concrete, also possible in laminated timber. Beam Bridge Structure comprises one or more beams. Commonly used for simple bridges with a span of up to 200 metres. The beam height is roughly 1/20th of the span. Made of steel, concrete or timber. Lens-shaped Beam Bridge Special version of the beam bridge. Structure comprises one or more beams whose shapes follow the bending moment diagram; construction height increases towards the centre of the span. Usually made of steel. Optimal use of material. Arch Bridge Structure comprises one or more arched beams. Suitable for relatively long spans (up to 150 metres). Made of steel, concrete or timber. The deck is located underneath, above or in between the arch. Truss Bridge Structure comprises one or more trusses (rigid frameworks of horizontal members with diagonal and sometimes vertical members in between). Usually made of steel. Suitable for spans of up to 500 metres. The deck is located in between or halfway between the upper or lower horizontal members. Many different truss types are possible. Vierendeel Truss Bridge Structure comprises one or more trusses without diagonal members. Compared to truss bridges, the connections between horizontal and vertical members are larger and more rigid. Otherwise, it looks like a truss bridge. The deck is located in between or halfway between the upper or lower horizontal members. Structure comprises one or more towers with steel cables attached to both tower and deck. Usually applied to bridges with larger spans of up to 500 metres. Made of steel or concrete. Culvert Bridge Road or earthen wall that passes over a water inlet pipe, sewer or drain. Floating Bridge Structure is supported by floaters made of steel or synthetic materials. Suitable for both traffic and pedestrian bridges. Materials Bridges can also be divided according to the structural material used: concrete, steel, timber or synthetic materials. Which material is used, closely relates to the chosen bridge type and depends on the span and load-bearing requirements of a bridge, among other factors. What implications does the choice of material for the main structure have on the design and appearance of a bridge? And when designing a concrete or steel (the two most common bridge materials) bridge, what factors require specific attention? Concrete bridges For concrete bridges, there are two available production methods: pre-fabrication and in-situ pouring, both of which have their advantages and disadvantages. Precast concrete for instance has a smooth surface on all sides, a higher level of finishing and a better quality guarantee. Given the high costs involved in making a mould and the relatively low price per cubic metre, precast concrete is mainly used for projects that involve considerable repetition of elements. An advantage of cast in-situ concrete is that it can be used for building bridges that have many different angles and for non-standard solutions, but its use does result in a slightly uneven pouring surface. Surface texture In the Boekelermeer bridge design, special attention was given to preventing the white-coloured concrete from becoming weathered. Concrete tends to become mosscovered and filthy looking quickly; therefore, for this bridge the supportsâ&#x20AC;&#x2122; large, flat precast concrete surfaces were ribbed. Due to the incidence of light on the ribbed surface, the moss and deposits are hardly visible. In-situ pouring In-situ pouring concrete was used to construct the culvert bridge for Woldmeenthe. As there is hardly any form of repetition in its design, this was the most suitable production method. And because of the brickwork finish, the rough and unattractive looking pouring side was of no concern either, as it cannot be seen. Partially precast Both precast and in-situ pouring concrete was used for the structure of the Kazernestraat bridge in Deventer. Most of its structure is made with in-situ pouring, but to save time, precast concrete was used for the Z-shaped elements supporting the brickwork. For the Kazernestraat bridge in Deventer, a UNP beam was used as a lintel. The appearance of dark coated, hot-rolled steel beams like these fits in very nicely with a historical setting and combines well with brickwork. When using steel, a distinction can be made between bridges made of hot-rolled steel (such as I or H beams), tubular or box beams (used for example in truss bridges), and bridges made of a combination of both (for example, a tubular beam with cantilevered hot-rolled cross beams). Rolled steel beams are relatively inexpensive. Box and tubular beams are relatively expensive; however, less steel is needed for box and tubular beam structures, which lowers the coating and galvanizing costs. For this reason, box and tubular beams are nevertheless attractive for certain structures. Because steel rusts, it does require a fair amount of maintenance. Steel bridges therefore are coated with one or several protective layers during production. Often, the steel is galvanised, either by hot dip galvanizing (dipping the steel in a hot zinc bath) or zinc spraying (hand-spraying hot zinc), and then coated with powder coating or wet-paint coating. Which conservation method is used depends on the size of the bridge elements and the steelâ&#x20AC;&#x2122;s thickness. Simple structure The most uncomplicated type of steel bridge is comprised of steel beams and a deck. For the cycling bridges of the Het Jeurlink project in Deventer, this bridge type was mounted with an aesthetic steel edge section, which is held in place by steel ribs. The Boomgaarden project in Wageningen proves that unique bridges can even be designed from a simple structure of rolled beams. Here, regular I and UNP beams are cambered and placed at an angle, resulting in bridges that are both cambered and tailored to narrow towards the middle. The bridges for De Erven in Emmeloord are examples of steel truss bridges. Hot dip galvanizing could not be used for the truss structures, because the air inside the box and tubular steel beams could explode under the pressure created by the 450째 Celsius zinc bath. This problem could have been avoided by creating holes in the surface of the beams, but that would have had serious visual implications. Therefore, the structure of these bridges was zinc sprayed. Certain structures can also warp during hot dip galvanizing, and this is the most common reason for choosing zinc spraying. The Onnapoort bridge in Steenwijk is comprised of a tubular steel beam with cut steel cross beams on top. This combination offers a relatively large degree of design freedom, as many cross beam shapes are possible. The choice of a bridge deck is influenced by many different factors, such as desired life expectancy, width, load-bearing capacity, span, desired visual appearance and budget, although production and conservation possibilities can also be influential factors. Non-movable (car or truck) traffic bridges for instance usually have a concrete deck. And when applying a steel deck made of different components, the prevention of rust and accessibility of all components for paintwork demands special attention. Slab deck Comprised of concrete slabs placed lengthwise. The slabs have recesses running the full length on both edges, in which concrete is poured in-situ to connect the individual slabs. Suitable for small spans. Entirely precast, usually not pre-stressed. No extra compression layer needed. Non labourintensive upon positioning. Smooth bottom surface. Precast concrete beam deck Comprised of several precast concrete beams placed side by side. A compression layer is poured on top. Beams are precast and available in various sizes and cross sections. Large deck height. Trapezoidal steel sheeting placed lengthwise or transverse with an in-situ poured concrete compression layer on top. Labour-intensive. Makes optimal use of the characteristics of both steel and concrete. Box structure Comprised of two horizontal steel plates with partitions and stiffeners in between, which together form a box. A lot of welding involved in production. Deck requires significantly less conservation than a regular pre-fabricated steel deck, because the structure is airtight, which means it does not corrode on the inside and therefore only the outside of the box requires conservation. Smooth top and bottom surface. Orthotropic deck Steel plate deck, strengthened with troughs (trapezoidal or trough-shaped steel sections). Often applied to lens-shaped beam bridges, movable bridges and truss bridges, in which the height of the trough deck equals the height of the upper or lower truss member. Also called an orthotropic deck. Deck of aluminium extrusion profiles Made of aluminium extrusion profiles placed side by side. Profiles need to be supported every 1.5 metres. Lightweight. Requires little maintenance during the first few years. Expensive production. Produces deck with longitudinal lines. Pre-fabricated steel deck Comprised of steel I or U beams placed lengthwise with a steel plate deck on top. Steel ribs or cross beams hold the beams in place. To prevent rusting and with regards to conservation, sufficient spacing between the deck and beams is necessary. Simple production method, but requires intensive maintenance. Structure is similar to the pre-fabricated steel deck, but with wooden slats instead of steel plate. Suitable for cycling and pedestrian bridges. Requires more maintenance than steel, and has a different appearance. Wooden slats are usually 15 to 20 centimetres wide and must be attached to the supporting steel structure at least every 60 centimetres to prevent bending. A small in-between slat space is necessary, allowing the wood to breath and rain to run off. Similar to wooden decks and steel plate decks. Synthetic elements are used instead of wooden slats or steel plate. Lightweight, which means the supporting structure can be somewhat lighter as well. Requires little maintenance during the first few years. Special version of the slab deck. Comprises a laminated wooden beam running the full length of the bridge. Labourintensive and relatively expensive. Smooth top and bottom surface. Suitable for small span pedestrian bridges. A bridgeâ&#x20AC;&#x2122;s camber is its slightly arched surface. It partly determines a bridgeâ&#x20AC;&#x2122;s appearance and influences its accessibility. A strong camber for instance gives a bridge a romantic image, but also slows down traffic and can discourage cyclists (see Amstelpark project, page 90). A strongly cambered bridge is also less accessible for disabled people. But while a bridge without a camber is then fully accessible, it may look like it is sagging. Virtually all wearing courses are a composite made of a resinlike synthetic material (the matrix) and aggregates. The matrix both binds the aggregate and adheres to the bridge deck below. The aggregate serves to roughen the surface, providing abrasion resistance. The aggregate especially determines the appearance of the wearing course. A variety of wearing courses is available, including bitumen-, acrylic- and polyurethane-based matrices with aggregates of different types of finely crushed rock. Asphalt wearing surfaces are also common, as is the use of paving stones and bricks. Railings Most bridges have railings, which usually comprise balusters, a railing in-fill and a handrail. Railings are there for a number of reasons. The height difference between a bridge and the water can, for instance, require railings as a safety measure, and often they are required by law. Railings of course are also necessary to make a bridge accessible for people who have difficulty walking. According to the Dutch Building Code, railings should be a minimum of 1.0 metres in height. For tall bridges, the minimal railing height is 1.2 metres above deck. To protect people from falling from a bridge through the railingâ&#x20AC;&#x2122;s open spaces, the elements of the railing in-fill should not be more than 50 centimetres apart. Railings moreover must be able to withstand a horizontal load of 100 kilograms per metre (kg/mÂš). To make railings, many different materials and production methods are at hand. In some cases, no balusters are needed: for example, when the trusses of a truss bridge serve as railings (see Limos project, page 116), or when the railing itself is sturdy enough (as was the case for the Floriande project, page 108). Railing elements 1 Balusters Vertical supports of a railing. Give the railing its sturdiness and connect it to the bridge. 2 In-fill Material placed horizontally or vertically in between balusters to prevent people from falling from the bridge. 3 Handrail Part of the railing that users can hold on to. The positioning and shape of the balusters (straight, slanted or bent) largely determines how people experience a bridge. An outwardly inclined railing for instance gives the illusion of freedom and playfulness, whereas an inwardly bent railing evokes feelings of safety and covertness. This sense of safety is especially important for tall bridges, which is why tall bridges usually either have straight or inwardly inclined railings. In addition, it is important to ensure that it is virtually impossible to climb up on the railings of tall bridges. The most commonly used railing in-fill material is steel, but wood is also an option. A railingâ&#x20AC;&#x2122;s in-fill, together with the balusters, defines a bridgeâ&#x20AC;&#x2122;s appearance. The desired image therefore greatly influences the choice of in-fill used. Cables for instance are suitable for a transparent or austere bridge, and a horizontal in-fill emphasizes a bridgeâ&#x20AC;&#x2122;s longitude. It is important that handrails are easy to grasp hold of; therefore, the size of a handrail should suit its function. Most common handrails are round or oval, with a 5 to 6 centimetre diameter. Flat handrails are also possible. Wood and steel are the materials often used for handrails. There are many possible positions of a handrail in relation to the balusters or the railing. The detailing of railings is different for each railing and closely relates to the chosen materials and the bridge structure. Certain design rules apply for most railings, however. For instance, when detailing the handrails and their connections to the balusters, avoid sharp edges or parts, because they could injure people. Railings are often also required to be adjustable, as this allows them to be aligned when mounted. As stated previously, technical knowledge is required when designing bridges. Many of these engineering aspects, such as foundation engineering or the connections to the underground infrastructure, do not translate directly to the design and appearance of a bridge, but merely prevent problems from occurring and ensure the bridge functions well. Some aspects however clearly relate to the bridge design. Those aspects are discussed here. Bridge bearings are devices designed to transfer loads and movements from a bridgeâ&#x20AC;&#x2122;s deck to its supports and foundations. The places in which its supports connect to the bridge are also often referred to as bridge bearings. Based upon their ability to transmit forces, there are three main types: fixed bearings (no movement possible), hinge bearings (allowing rotation about one axis and no translation) and roller bearings (allowing rotation about and translation along one axis). To allow movements caused by weatherinfluenced extension, bridges usually have a hinge bearing on one side and a roller bearing on the other. Another often-used type of bearing is the so-called shallow foundation. This is comprised of a concrete slab, placed at least 60 centimetres below ground level to prevent frost. No piles, which are relatively expensive, are necessary. However, soil consolidation is usually required underneath the foundation. Concrete cap on piles bearing The standard method of supporting bridges is one that uses a cap (a rectangular beam placed transversely underneath the bridge deck) on concrete piles. This bearing is uncomplicated and low-cost, but does not look very attractive. Sometimes a bearing on top of tubular steel piles is used, in which the piles act as foundations. The bridge structure is attached to steel flanges that are welded onto the pile tops. Conservation of the steel piles does require extra attention. An often-used and good-looking detail, is the use of a steel angle section on the dividing line between bridge deck and road surface. This steel angle section creates a smooth and attractive transition from bridge to road surface, with the paving simply continuing up until the angle section. The use of a concrete strip is a commonly used, but not very attractive, alternative. Bridge abutments are structures that support the ends of a bridge. They are also called land abutments. In other projects, such as the Baanstee Oost bridges, solid bridge abutments are designed. Here, the concrete abutments are clearly visible. To prevent them from being too dominant, they are consciously placed slightly inwards in relation to the steel edge beams. Brickwork is used extensively for the Woldmeenthe housing development’s bridges in Steenwijkerland, resulting in a traditional image. Because of its position in the water, an extra hard brick with a high level of water impermeability was used for the brick-clad bridge abutment. The brickwork detailing received extra care: in keeping with the development’s Amsterdam School theme, it has recess jointing and soldier courses. Retaining walls or quays can also serve as bridge abutments, as the Looijersgracht bridge illustrates. At its highest side, this bridge is fixed to the retaining wall by a steel plate that is attached to the wall’s underlying concrete structure. On the lower side, the bridge connects to the brickwork using a roller joint. Bridges sometimes not only have bridge abutments for support, but intermediate supports as well. These supports divide the span into multiple smaller spans: a smaller span means the structure can be lighter. Usually, intermediate supports have hinge joints on both the top and bottom, which means they only allow motion in one plane and transmit axial forces. Intermediate supports can take on a variety of shapes and contribute to the overall bridge appearance. The supports of the IJsselmonde bridges are not located in the water, but on land. This way the foundation costs are significantly lower, as foundations in the water are relatively expensive. The supports are each comprised of two times six diagonal compression members that meet at both bottom and top. The De Bogen bridges in Nijkerk have quadruple supports made of large steel box beams. The slender-looking bridge structure results from the use of forked supports, which divide the main span into smaller sections. Combined with stairs The â&#x20AC;&#x2DC;ecozone bridgeâ&#x20AC;&#x2122; in Het Jeurlink has stairs on either side of the bridge deck, just above where the supports are, which provide access to the island underneath. In order to prevent the stairs from serving as supports, the bottom of the stairs has roller bearings. When downward movement of the bridge occurs, the stair bottoms simply move outwards. Costs The building costs of a bridge are different for each project and are influenced by all aspects of its design. Possible ways to cut back costs, if necessary, also vary per project. However, certain basic rules apply. Supports Sometimes decreasing or increasing the number of supports can lead to savings. For instance, it can be profitable to use as fewer supports as possible when relatively expensive, long driven piles are needed for a bridge’s foundations. But when using shallow foundations for the bridge’s intermediate supports, it can be just as economical to increase the number of supports. The savings made by using a lighter bridge structure will offset the increase in foundation costs. Structure The least expensive structure is often one that is made of standard beams. Combining this with a striking railing, a specially designed edge beam or a uniquely designed intermediate support, can nonetheless result in a distinctive bridge design. Modular system It is more economical to produce bridges that comprise several identical structural modules than it is to produce those with unique parts only. Repetition – the use of as many identical parts as possible – can, to a certain extent, result in savings. Project size A project’s size can also lower the final costs per bridge. For instance, three or more identical bridges within the same project usually means a savings of 10 percent. This cost saving effect should not be overrated, however, as the relation between repetition and project size is of great influence. A small project with little repetition will still cost more per square metre than a large project, due to the relatively large start-up costs. Design process The previous part illustrated what is involved in designing a bridge. But how does the design process evolve in reality? And how does a design actually come about? This part illustrates the design process based on two projects: a family of 59 bridges for Deventer City Council, and the design of a single bridge across the Looijers Canal in Steenwijk. Het Jeurlink family of bridges Het Jeurlink is a recently built housing development on the outskirts of the city of Deventer. Not only is it a very ‘green’ development, but it is also rich in water. At an early stage of the area’s development, the Deventer City Council asked several designers to come up with a design vision for the development’s 59 bridges. Deventer clearly expressed its need for austere, ‘non-designed’ bridges that would suit the tranquil nature of Het Jeurlink. Right from the first sketches, the desired austerity was ipv Delft’s primary starting point for the bridges’ design vision. In order to maintain a tranquil street scene even in those places where several bridges are situated close to each other, a simple structure was chosen and combined with transparent railings. The City Council enthusiastically received this design vision and, shortly thereafter, extended official commissions to ipv Delft for designing the entire family of bridges. within the ecological zone. To emphasize the continuity of the cyclist route, ipv Delft proposed combining the two bridges into one long bridge instead. Challenge What followed was the challenge of ensuring that all types of bridges suited their specific function and location, while at the same time sharing certain design features and ensuring the desired tranquility of the project as a whole. The design vision of simple structures and transparent railings, as developed in the early stages of the project, now came in handy and served as a starting point for the actual designs. Prior to finalizing the different designs, a set of family characteristics was chosen to ensure visual entity. The main family characteristics are the railings, which comprise outwardly bent balusters (to create an inviting image), a double wood and steel handrail (providing a refined and recognizable appearance), and stainless steel cables (providing transparency and austerity), and the exposed steel edge beams. Upon finalizing the various bridge designs, ipv Delft worked out the differences in the designs in subtle but distinctive ways. This primarily involved creating variations in the bridge deck and structural principles; however, there were also subtle differences in the railing designs. The sketches on this page represent the preliminary design. The final results can be seen on the following pages. tion of the bridges with the neighbouring public roads. This results, for instance, in the continuation of the private bridge’s railings along the public road. Elsewhere, the traffic bridge railings stretch along the road right up to the nearby cycling path, in order to increase safety and recognizability. Conservation All steel elements of the family of bridges are hot dip galvanized. Due to their susceptibility to wear, the railings were subsequently powder coated. Powder coating provides a relatively hard protective layer. The bridges themselves however are sufficiently protected with three layers of wet paint coating. The wooden handrails are treated with wood oil, which does need to be renewed annually, but is much easier to apply than regular paint, as sanding for instance is not necessary. The laminated wooden beams are untreated and fitted with a wearing course only. Looijersgracht bridge Canals and city walls surround the historical city of Steenwijk. One of these canals is the Looijersgracht (or ‘Looijers Canal’ in English). The canal, which had been drained and filled in with soil for decades, was restored to its original glory at the turn of the 21st century. The City Council wanted to maintain the much-used cyclist and pedestrian route into the city centre, which crosses the restored canal, and decided to ask ipv Delft to design a bridge over the Looijersgracht. ipv Delft used the Onnapoort bridge (see Onnapoort project, page 128), which they had previously designed for the Steenwijkerland City Council, as a starting point for the design of the cyclist and pedestrian bridge. This steel bridge, with its modern appearance, fit in remarkably well with the historical environment. Although the desired appearance of the Looijersgracht bridge was clear from the start, the location did however offer an interesting challenge: the banks on either side of the canal are of different heights. cumbersome ramps or steps. Furthermore, due to its curve, the deck now logically connects with the already present cycling route leading into the city centre. The final design comprised a bridge that starts off perpendicular to the lower bank and then curves towards the right. It connects to the higher bank (the one nearest to the historic city centre) at a 45-degree-angle. The bridge abutment on the steep grass embankment is triangular in shape, which allows plenty of space for three steps. Structure Similar to Onnapoort, the Looijersgracht bridgeâ&#x20AC;&#x2122;s structure is comprised of a tubular steel beam with cantilevered cross beams on top. Only the shape of the tubular beam is different. To emphasize the height transition, the tubular beam does not follow the bridge deckâ&#x20AC;&#x2122;s slope, but rather is placed horizontally; the cross beams assume the height transition by gradually increasing in height. The tubular beam itself connects to the brick embankment on the lower bank and to a brick-clad triangular abutment on the other side. The Onnapoort design also inspired the choice of both railing material and bridge deck. The railings are comprised of double, outwardly bent sheet steel balusters, a steel tube railing and a stainless steel cable in-fill. With its tranquil appearance and high degree of transparency, this railing fits in very well with the surroundings. A different type of baluster, which combines steel and brickwork, was designed to serve as end balusters. They are made of brickwork in a Gothic arch shape and have a steel panel cover, whose shape closely relates to the regular baluster shape. A special version of the railing also stands on top of the brick quay walls on either side of the bridge: short, double balusters with a steel handrail. In keeping with the modest design of the bridge, the deck, which is comprised of steel plate with stiffeners attached underneath, has an anthracite-coloured wearing course. The three steps were initially supposed to be of the same colour, but ultimately it was decided that only the second step would be of this colour. The other two steps are of a slightly lighter grey colour. Thanks to this alternate colouring, the steps are clearly visible from a distance. Conservation All steel elements of the bridge have a 3-layer coating. Projects No project is the same. Each location sets different boundaries and every client has its own wishes. The two projects discussed in â&#x20AC;&#x2DC;Design processâ&#x20AC;&#x2122; only showed a fraction of the countless possibilities. That is why here, you will find 26 more projects of which setting, design and detailing are described. This family of seven bridges was designed for Albertshoeve, a new housing development of contemporary architecture in Castricum. The type of housing built in this area can also be found in various other cities in the Netherlands. Challenge To design a series of bridges that will give the development its own distinctive look. the bridges, those with a large span comprise a lens-shaped bridge on the main span and two flat, regular girder bridges on either end. • Hinge joints connect these ‘end bridges’ to the main bridge. This relatively simple type of joint (using only one dowel, compared to multiple dowels for a rigid joint) was only possible, because the divisions are situated exactly where the bending moment equals zero. Family characteristics All bridges share the use of light-grey coloured steel as well as the inwardly bent railings, which are made of sheet steel and have a steel cable in-fill. This bridge acts as one of five entrances to Amsterdam’s Amstel Park. The design is the result of close collaboration with artist Stefan Strauss. Challenge The park is a designated pedestrian zone, which is closed off at night. Therefore, the bridge needed to create a barrier to keep out cyclist and have room for a gate, so the entrance could be closed off. Inspiration The covered pedestrian bridges that can be seen throughout the United States and which owe their red colour to the use of red lead paint, inspired the design. In Amsterdam, a regular red paint created the desired colour. Structure • The bridge is composed of G-shaped frames, which have horizontally fitted wooden slats attached on the inner side. • To discourage cyclist from using the bridge, it is very strongly cambered. As a result, the G-frames are slanted, except for the one in the middle. Detailing • The bridge’s asymmetrical roof is much lower on the side of the park, creating a ‘vacuuming effect’, which is strengthened by the decreasing vertical space between each slat as well as the decreasing slat height. • The last two frames on the side of the park are not G-, but O-shaped. Within the closed structure of these frames is a gate. This gate is hardly visible from the outside because it’s made of the same type of slats as the bridge walls, and both have matching horizontal lines. The two pedestrian bridges were designed for Baanstee Oost, an industrial zone in the city of Purmerend. One of the bridges is located on the outskirts of the industrial zone, the other one in its centre. wooden decking, which allows it to fit in with its tranquil surroundings. • The arch bridge has a rectangular plan and seems to narrow towards the middle. This effect was achieved by designing trapezium-shaped land abutments and placing the railing’s end balusters on the outermost corners of the abutment, resulting in the railings curving slightly outwards towards the end. Detailing The railings are comprised of steel handrails, stainless steel horizontal cables and cut steel balusters, which coincide and meld with the vertical elements of the bridge structure. These two cyclist and pedestrian bridges provide access to the De Bogen housing development in Nijkerk. Structure • The bridges’ structure comprises two lightly cambered tubular steel beams with deck supporting cross beams on top. Two forked supports made of sheet steel box beams support both bridges. • A weir was planned to be built on one of the locations. It was decided however to combine both the weir and bridge, with the weir serving as the foundation of the forked supports. Detailing • The slanted steel edge beams span the entire length of the bridge. Owing to the right combination of the steel’s thickness and radius, the beams were flexible enough to be shaped by their own weight upon assembly. • The railing in-fill is made of horizontal steel slats placed at an angle, allowing pedestrians and cyclists views of the water. All three bridges - two cyclist and pedestrian bridges and one emergency bridge - were designed for the Boomgaarden housing development in the city of Wageningen. The railings are made of steel balusters and custom-made laminated wooden beams spanning the entire length of the bridge. These beams extend through holes in the balusters. The emergency bridge, which must be accessible for emergency vehicles, has a concrete deck, with the railings attached to the sides of the deck. In this way, the concrete is less obtrusive and all the bridges retain the same look. Inspiration The design was inspired by the location’s orchard history (in Dutch, a ‘boomgaard’ is an orchard). Hence the use of wood and the overall ‘romantic feel’ of the bridges (their camber and their narrowing towards the middle). Structure Despite their unique appearance, the bridges are constructed of simple rolled steel U beams and wooden decking. The beams were arched and then placed at an angle, resulting in the bridges’ narrower middle section. Street style The bridges are part of a complete ‘street style’ of mailboxes, lamp posts and signage that was designed specifically for the Boomgaarden development. This family of bridges was designed for the Broekpolder housing development in Beverwijk-Heemskerk and comprises several types of cyclist and pedestrian bridges, as well as emergency bridges. Challenge In accordance with the clients wish, the challenge was to design simple, yet original and low cost bridges. Design The design, which combines a simple steel I beam structure and wooden decking with distinctive railings, was inspired by the client’s wish for striking bridges. Detailing • The railings are comprised of cut sheet steel balusters, a steel rod in-fill and a wooden handrail. Doubled balusters act as end balusters. • At the ends of the railing, the handrail extends downwards in a circular motion, at which point the wooden handrail merges with steel tubes of the same diameter. A pin joint invisibly connects both materials. Family characteristics The railings, designed specifically for Broekpolder, are present on all the bridges. Other family characteristics are the wooden decking, the slight camber and the exposed steel edge beams. This bridge dam is located on Deventer’s Kazernestraat, a street that became an important through road and city entrance after the historic city centre was turned into a carfree zone. The bridge was designed to replace the existing road on an earthen wall, because this road did not have the desired appearance and atmosphere. Challenge To turn a busy, repellant artery into a pleasant road with an inner city feel. soldier course at the top, is supported by a precast concrete Z-shaped element that hangs from the top of the steel sheet piling. Detailing The railings are made of opened-up cast steel balusters and two horizontal steel tubes that link through them. Realization This project was completed only six months after first contact with the client, which is extremely fast. In order to increase safety and improve the inner city feel, traffic and cyclist lanes were separated. The brick walls on both sides of the traffic lanes, and the stone coloured concrete borders that run alongside the cyclist lanes, emphasize this separation. Furthermore, the cycling lanes and footpaths descend towards the middle of the bridge, whereas the traffic lanes ascend. The bridge’s city gate appearance derives from the wall elements and the lampposts on top of them. To fit in with the surroundings, an especially transparent railing was designed. This cyclist and pedestrian bridge crosses the Emmen by-pass and connects the Delftlanden housing development with the existing town. Design • The bridge design is location-based: the curve creates the most logical route between the housing development and the city centre. The central reservation offered the best location for a bridge support. Because the bridge was required to be an icon in the surrounding landscape, designing a cablestayed bridge was the obvious choice. • Specially designed supports carry the bridge on both sides of the by-pass, ensuring that motorists are not deprived of a view of the countryside. The bridge does not end until the end of the curve, where the elevated cyclist and pedestrian path continues onto the embankment. Structure • The main structure comprises a steel tower, 14 steel cables and an 80-metre-long tubular steel beam with cross beams attached to one side. The tower leans slightly rearwards, away from the bridge deck, in order to keep it balanced. In this way, the bridge’s central weight is located directly above the tower foot. • The Delftlanden bridge is a multispan bridge; the cable suspended bridge is the main span, and smaller girder bridge sections on steel supports cross the other, smaller spans. Like the tower, these specially designed supports lean slightly backwards. â&#x20AC;˘ Several decimetres separate the bridge deck from its neighbouring tubular steel beam, which means the beam is clearly visible from the bridge itself, and from underneath the bridge, where a strip of light is visible. â&#x20AC;˘ Specially designed ball joints connect the steel cables to the tubular beam, which allows for small movements of the bridge deck and cables. â&#x20AC;˘ The handrails are made of aluminium extrusion profiles, developed especially for this project. Aluminium was chosen as the construction material, because it allowed for the handrail to be oval-shaped and for the simultaneous integration of the handrail and baluster fitting. The two identical bridges were designed for De Erven, a new housing development in the polder landscape near Emmeloord. This location was notable for the height difference between the two banks. Structure To emphasize the height difference between the banks, an asymmetrical truss bridge was designed, with its supports placed close to the lower bank on one third of the span. The truss beam itself follows the bending moment diagram, rising above the deck on the higher bank side, and disappearing underneath as it approaches the lower bank. Detailing • The truss’s upper and lower tubular steel beams each have a different shape: a slender-looking circular beam that follows the bending moment diagram, and a square beam that facilitates a simple connection to the trough deck (see Design guide, Bridge deck, page 35). • Towards the higher bank, the vertical elements of the truss also act as balusters wherever the truss beam rises above the deck. All six bridges span the same elongated waterway in the Floriande new housing development in Haarlemmermeer. This family of bridges comprises three small identical bridges; a 36-metre-long bridge with a connecting jetty; and a maintenance bridge that provides access to maintenance vehicles. Challenge To design a family of unique bridges at a relatively low cost. Design • The project was completed within budget, due to the combination of a simple structure made of steel beams and wooden decking with unique railings. • To make the relatively wide maintenance bridge look as slender as the other bridges, steel floor grating runs along both sides of the deck, spanning the full length of the bridge. • The jetty is made of three separate parts placed at right angles to each other. In order to increase the adventurous nature of the jetty, the middle section is floating. To make way for the mow boat, this section is easily movable, and yet it is significantly less expensive than a conventional movable bridge. Detailing • The unique Floriande railings, made of steel strips, are visible on four of the bridges. There is a twist in each vertical strip, which differs in height. As a result, the play of light and shadow makes the railing appear to be undulating. Although there are no railings on the jetty, a special support rail was designed to make crossing from the regular jetty to the floating jetty accessible at all times. • Two poles secure the floating jetty, which can move approximately 20 centimetres upwards, should water levels rise. Family characteristics Although not all the bridges have Floriande railings, they do all share the exposed steel edge beams and the wooden decking. The jetty height is such, that the height difference between floating and regular jetty is twenty centimetres maximum, which is the height of a step. The pedestrian and cyclist bridge spans a 25-metre-wide waterway in Amsterdam’s Bijlmermeer district and serves as the main pedestrian access to two colleges. Challenge To resolve the 1.50-metre height difference between the two banks in a way that also made the bridge accessible for wheelchairs. Design • The bridge’s curve gives it a longer span, making it possible to more gradually achieve the transition in height. This bend in the bridge meant that it also presented a logical pedestrian route between the nearby underground station and the college buildings. • The abutment on the lower bank is triangular, which makes the bridge easily accessible from other directions – not just from the direction of the underground station. The paving along the waterway extends onto the abutment, as does the open steel grid deck stretching along both sides of the deck. Structure The load-bearing structure comprises two tubular steel beams with cross beams on top. Six forked columns support the tubular beams. The bridge abutment on the higher bank is located above a multi-storey car park, which could not be used as a load-bearing support. The two forked columns nearest to the car park were therefore placed very close to the building, which makes the bridge self-supporting on this side. Detailing • With a distance of 3.50 metres between the deck and the water at the bridge’s highest point, the railings are inwardly angled to provide the necessary sense of safety. The Vshaped balusters made of sheet steel form a unified whole with the narrow ends of the cross beams, which are also Vshaped. • On the side where the car park is located, the only real connection between the self-supporting end of the bridge and the bank is a hinged steel plate that has been fitted to the bridge. This ramp rests on a steel angle section on the corner of the car park’s roof. Along the edges under the inwardly angled balusters, the decking consists of open steel grid decks spanning the entire length of the bridge. This not only offers views of the forked supports, but also makes the bridge look slender. This pedestrian and cyclist bridge was designed for the Kernhem district in the city of Ede and connects two squares on either side of a 24-metre-wide wooded area, crossing a small stream. Two similar, but plainer bridges were designed to cross the area downstream. The wooded area is inhabited by a large colony of bats. To design a bridge that fits in with the existing rows of trees and can be used as a means of conveying the significance of the wooded area to the local community. The design comprises two steel girder bridges over the water (the legs of the letter V) and a landing on the wooded bank, allowing for a shorter span of the bridges. Not only does this result in more slender bridges, but it also means the total structure is less expensive than if a 24-metre-wide bridge had been built. Design • In order not to interrupt the wooded area, a V-shaped plan was designed, situated between trees. The left leg is designated for both cyclists and pedestrians; the right leg serves as a footpath, thus creating a fast and a slow route. The design of the V-shaped bridge emphasizes the different characteristics of the two routes: the fast lane is relatively wide and almost flat, whereas the slow lane is strongly cambered. For pedestrians, the slow lane crossing thus becomes a leisure experience. • The existing double bend in the stream was relocated to just underneath the bridge, so that the water is now clearly visible in the gap between the cyclist and pedestrian lanes. Also, an information panel was erected next to the gap, informing passers-by of the importance of the wooded area and the bats that inhabit it. Detailing • The entire structure has a wooden decking. All steel edge beams are left exposed, as is the steel frame of the landing. • There is a height difference between the abutments of the cyclist lane and the footpath, which is resolved by creating two steps. The steps have steel angle sections, which are made of stainless steel to make them wear resistant, as are the handrails. All deck edges are covered with steel sections. In some places, stainless steel was used to increase wear resistancy. This steel pedestrian bridge is located on the Limos site, previously a military station, in the city of Nijmegen, and spans the entrance to a car park. The aluminium-coloured trusses also double as railings. For safety reasons, there are horizontal stainless steel cables inside each truss, just in front of its diagonal members. On one side of the bridge, an identical truss placed on the ground acts as an extended railing. Design In order to create headway for trucks to pass underneath the bridge, a pony truss bridge was designed, carrying pedestrians between trusses that are not cross braced with a portal. The 10-metre-long bridge’s structure is comprised of the two trusses, which are made of steel box beam sections. The cable-stayed bridge is located at a waterway intersection in the Literatuurwijk housing development in Almere. Challenge In accordance with the client’s wish for a remarkable bridge, the challenge was to design a bridge that would serve as a landmark for the housing development. by two steel cables placed on either side. No other supports were necessary. Steel rafters on one side of the tubular beam support the bridge deck, which bends slightly around the tower. Detailing Concealing the connections of the steel cables to the other structural elements received special attention. To conceal these connections, small pipe sections that go into the tower and into the tubular beam were used, and the cables are connected inside these pipe sections. Due to the bridgeâ&#x20AC;&#x2122;s light curve, the structure underneath the deck becomes visible. In addition, it creates a sense of spaciousness. This large family of bridges was designed for the Rietveld Park in Nesselande, a new housing development on the outskirts of Rotterdam. The elongated park, comprising many islands, is located underneath power pylons. The park features many cycling and walking routes. Bridge types The bridges can roughly be classified into arch bridges and flat bridges. Arch bridges were used on all longitudinal cycling and walking routes, as well as on the transverse routes. All bridges that provide access to an island are flat bridges. steel arch bridges’ vertical elements (balusters, cross beams and the vertical elements of the Vierendeel trusses) are in line with each other, which results in a balanced, well-designed appearance. Detailing • The railings are made of rolled steel T-section balusters and a stainless steel cable in-fill. Depending on the bridge’s function and location, the railings are either inwardly or outwardly inclined. On the longer bridges, the railings have integrated lighting: every 20 metres a specially designed lamppost rises from a slightly broadened baluster. • Due to their location underneath power pylons, all bridges had to be grounded. This meant, for example, that all the 6-metre-long steel tube handrail sections needed to be connected to each other. Usually, a small external grounded continuity cable is used, but here a specially designed sliding contact was fitted to the inside of the handrails. The flat bridges, which are scattered throughout the entire Rietveld Park in the Nesselande housing development, provide access to the islands, connecting them to each other and the shore. Because of the large number of island bridges, a modular system was developed. The system’s main elements are 6-metre-long bridge sections of steel beams and wooden decking that are either 1.25 or 2.5 metres wide. One or two tubular steel pipes support all sections on either end, which means no land abutments are needed, because the steel pipes can also be used on land. The steps that provide access to the high bridges are part of the designed modular system, as are the fishing jetties. Challenge To design bridges that provide pedestrian access to the islands, that allow the mow boat to mow the islands’ shores, and that keep the power pylons on the islands accessible for maintenance at all times. Design Two bridges provide access to each island with a power pylon on it: a small, sloping pedestrian bridge that creates headway for the mow boat, and a wider bridge that provides maintenance vehicle access, but has no headway underneath. The sloping bridges have several steps on both ends. Detailing • To prevent dogs from crossing the bridges, each bridge has an open steel grid middle section. • The 6.5-centimetre-wide slats of the wooden decking are much smaller in width than the average decking, which is usually made of 15-to-20-centimetre-wide slats. As a result, the decking has a Scandinavian feel. Of all the flat bridges, eight are jetties. In the historical city of Steenwijk, the Onnapoort Bridge connects two old fortification walls, crossing one of the main entrance roads to the city centre. Even on the smallest scale, a subtle historical reference is included: the balusters are attached to the edge beam using steel plates in the shape of a shield. The historical city and its medieval fortification walls inspired the design. The bridge’s structure, for instance, comprises a fixed arched tubular beam, which refers to the brick Roman arch structures. In addition, the bridge and the fortification walls combine to form a contemporary version of the traditional city gate. The main structure comprises a fixed tubular steel beam with triangular cross beams on top, which support the deck. In order to enhance the reference to a medieval arch bridge, the steel beam was fixed on both sides. Consequently, the bridge’s thermal expansion behaviour received special attention; instead of expanding outwards lengthwise, the bridge can simply expand upwards. These four cyclist bridges are part of a continuous cycling route and are located in De Oudvaart in Sneek, a new housing development of self build building plots and contemporary architecture. Two of the four locations have a height difference between the banks. Design As with the De Erven bridges (see De Erven project, page 106), an asymmetrial design was chosen, wherein the support was placed near the lower bank to emphasize the height difference. The structure roughly follows the bending moment diagram, rising highest above the deck over the longer span. The same design has been used on all four locations, including the ones with banks of equal height, as it has the advantage of a spacious underneath passage. Detailing The railings are attached to the main structure only and seem to float above the deck, which emphasizes the bridge’s longitudinal direction and its futuristic appearance. These bridges provide access to an island playground area on the Ouverture housing development in Goes. Inspiration The adventurous surroundings served as the inspiration for the design of these two playfully styled bridges. Design • One of the bridges is made of three separate parts (to discourage cyclists from using it) and comprises a floating wooden platform and two gangplanks. The floating platform is secured to two poles and can be easily moved when maintenance of the waterway is required. Roller joints on the gangplanks ensure that the entire bridge can adjust to changes in water level. • The second bridge is designed as a wide plateau, to facilitate moving playground equipment to and from the island. • There is a row of rising wooden poles on each of the bridges, which acts as both a playful element and a railing. Detailing The safety and durability of the wooden poles received extra attention; for instance, the pole tops are slanted to prevent people from standing or walking on them. Two steel plates enclose the pole feet in such a way that the wood has breathing space underneath, which prevents it from rotting. The bridges were designed for the Rietlanden housing development in Pijnacker, to provide access to two islands. Design The shape of the bridges follows their function: if the bridge crosses a waterway within the development, it is symmetrical, but if it acts as a main entrance gate it is asymmetrical, narrowing towards the island. Structure Special edge beams were designed to make the bridges look as slender as possible. They have been angled in such a way that the bottom side ends up pointing outwards and becomes visible, which results in a sense of slenderness. Detailing • Rietlanden (‘Reedlands’, in English) owes it name to the reed covered banks on the development, which in turn inspired the design of the round and tapered balusters. The balusters are made of cast aluminium and are attached to the bridge via invisible pin connections. • The bottom side of the bridge received extra attention: the abutments are rounded off and the edge beam has been slanted. This way, even canoeists get to see a well designed bridge. Costs The project was completed for half the available budget, due to the combination of especially designed edge beams with standard beams and the use of a sand coloured wear surface instead of the much heavier asphalt layer, which allowed for the bridge structure to be lighter. These two bridges, which are set in a green, wooded area, were designed to improve the accessibility of two TramPlus stations (TramPlus is an extra fast and comfortable tramline) in Rotterdam’s IJsselmonde district. Costs For both bridges, ipv Delft used its system of standard bridges, which offers carefully designed and low-cost standard bridge solutions. Structure • The two bridges are both comprised of steel edge beams with a deck in between. The longest bridge (35 metres) has supports on either side of the waterway, while the shorter bridge has supports on one side only. • To make the structure of the 35-metre-long bridge as slender as possible, the bridge is comprised of three separate parts, which, consequently, also divides the span in three sections. The two cantilevered outer bridge sections, which are both supported by a V-shaped structure, support the bridge’s middle section. Detailing • One of the bridges is located close to a residential area. In order to prevent any possible noise disturbance, this bridge has wooden decking. The other bridge, which is not located near a residential area, was fitted with a low maintenance steel deck. Lighting was an integral part of the bridge design. Specially designed brackets, which are attached to the edge beams, connect the lampposts with the bridge. The lampposts have standard light fixtures. Designed as part of a family of 27 bridges for the new Waalsprong housing development in Nijmegen, these four bridges were the first to be completed. The bridges’ main structures comprise beams and forked supports, made either of steel or of concrete, depending on the function of each individual bridge. Traffic bridges, for instance, have both concrete beams and supports, whereas the cyclist and pedestrian bridges are made of steel beams and supports with a steel upper section and a concrete lower section. The concrete lower section of the supports – with its elliptical cross section – is the most striking element of all the Waalsprong bridges and gives the supports an amazingly slender appearance when viewed from the sides. Inspiration Inspiration was found in the development’s immediate surroundings: not only is it situated in the Betuwe fruit tree district, but it is also located on the dividing line between urban and rural landscapes. The cast steel balusters refer to the region’s history and the transition from urban to rural landscapes is emphasized by the balusters, which are vertical on the city side but then increasing slope towards the rural side, ending in a 45-degree angle at the final baluster. A brick embankment enclosing a rotunda that partially stands in the water acts as the bridge abutment for one of the bridges. The brickwork, located on the side of the bridge nearest to the city, rises to a metre above ground level and accentuates the transition from an urban to rural landscape. Detailing â&#x20AC;˘ On all bridges, whether concrete or steel, the balusters are attached to the slanted edge beams. Because each baluster is at a different angle to the bridge deck, this connection required special attention. By using a specially designed circular steel flange, all the balusters could be fitted in the same way, resulting in a overall look of tranquility. â&#x20AC;˘ Throughout the development a special kind of concrete paving was used; this was also laid on the footpaths of the bridges. Family characteristics The visible characteristics seen on all Waalsprong bridges are the cast balusters, the steel cable railing in-fill, and the forked supports and their oval lower sections. This family of bridges was designed for Waterland, a new housing development of modern, contemporary architecture in Alblasserdam. The project comprises one culvert bridge, which is the main entrance to Waterland, two traffic bridges that provide access to the area, and three cyclist bridges that connect the development to the countryside. Depending on the bridge’s function, it either comprises steel or concrete beams; the cyclist and pedestrian bridges have a steel structure, the traffic bridges a concrete one. The railings also indicate a bridge’s function: the cyclist and pedestrian bridges have smaller railings. Detailing The railings consist of a black sheet steel frame, with vertical steel strips welded onto the inside of the frame. Family characteristics Apart from the railings, which were specially designed for this project and are featured on all bridges, the playfulness of the varying cambers is a definite family characteristic. The railings have no balusters. They each comprise a rigid frame made of black coloured steel strips and were transported to their location in the Waterland development in one piece. This cycling and pedestrian bridge was designed for the De Weuste housing development in Wierden and crosses a waterway, just before it arrives at a nearby lake. The City Council wanted to build a striking and unique bridge on this location. Design The bridge’s location near the lake inspired the design of a curved and cambered bridge. This design provides excellent views from the bridge and satisfies the client’s wish for a bridge that also serves as a landmark. Structure • The bridge’s structure comprises a tubular steel beam with cantilevered cross beams on top, supporting the bridge deck, and a compression arch parallel to the beam. Steel suspension rods form the only connection between the freestanding compression arch and the tubular beam. Due to the use of a compression arch, the height of the steel beam is relatively low. • Because the tubular beam gently curves itself around the arch and both structural elements do not touch each other, the bridge deck appears to float. This family of cyclist, traffic and culvert bridges was designed for the Woldmeenthe housing development in Steenwijk, an area full of waterways, islands, peninsulas and 1930s style architecture. To cut down costs, two types of culvert bridges were designed: one entirely made of brickwork, and one in which the natural bank continues underneath the bridge deck. Because the latter only requires a brick retaining wall, it is less expensive, which is why this version was used wherever possible. Inspiration The Amsterdam School of Dutch expressionist architecture, with its refined brickwork acted as the main theme of and inspiration for the entire development, and consequently inspired the design of the Woldmeenthe bridges. Detailing • The architectural movement’s influence can for instance be seen in the use of a soldier course (bricks laid vertically on one end) in the rounded land abutments, the raked joints and in the use of hard stone end ornaments. • The cylindrical end balusters have integrated lighting. Old-fashioned craftmanship was used to create the concrete land abutment ends. This family of strongly cambered cyclist and pedestrian bridges, flat traffic bridges and culvert bridges was designed for the Wolveschans housing development in Leek. The railings comprise a framework of sheet steel balusters and vertical sheet steel strips, with a closed steel panel at the ends. These end panels each have a rectangular wooden handrail on top. Inspiration The urban design by Ad Habets had as its main theme the so-called ‘borgen’: borgen are large, stately farmhouses that can be found in the Leek area. Many of these farmhouses feature a romantic garden, designed in the French classical style. The bridges’ strong cambers, as well as the detailing and use of steel that strongly resembles the use of traditional wrought iron, shows how the bridge design was inspired by the romanticism of the borgen. Family characteristics The same railings – made of black-coated steel strips – are used on all bridges, and this material was also used for all elements of the complete street style designed for the Wolveschans development. Apart from the bridges, this street style comprises benches, signage and the entrance gate, among others. This bridge was designed to cross the ‘Borrekeen’ stream in Zuid-Beijerland, replacing an old existing bridge, and was commissioned by the Dutch Forestry Commission. Due to its simple structure, this bridge was designed and built in a short timeframe: less than one hundred days elapsed between the first meeting and the completion of the bridge. Challenge To design an extremely economical, but attractive and durable bridge. Structure The bridge comprises three steel I beams and timber decking. The balusters have been welded directly onto the steel beams, in order to ensure a rigid structure and to keep the costs as low as possible. The railing’s steel rods have in turn been welded onto the balusters. Gerhard Nijenhuis Gerhard Nijenhuis received his MSc in Industrial Design Engineering from Delft University of Technology in 1991. He worked on the Erasmus bridge design at design office Van Berkel & Bos for a year and in 1996 he founded ipv Delft. ipv Delft ipv Delft is a Dutch design company located in the historic city of Delft (the letters ‘ipv’ stand for ‘Ingenieursbureau voor productontwikkeling’ in Dutch, or ‘Engineering company for product development’, in English). Over the past ten years, the company has gradually developed into the Dutch specialists in bridge design, with an impressive portfolio of over 200 completed bridges and counting. In addition to custom-made bridge designs – examples of which are presented in Bridging the Dutch Landscape – ipv Delft also builds standard bridges based on its specially developed ‘ipv bridge system’, which offers clients an opportunity to commission simple, yet well-designed and well-engineered bridges, at highly competitive prices. The design office also specializes in designing other outdoor products, such as street furniture, lighting and signage. All projects have austere yet inspired designs, with a high degree of detailing. Knowledge, inventiveness and sense of reality always remain at the core of the company’s design process. Mr H. Slijkhuis, Mr S. Smit, Mr E. Snijder, Ms A. Soede, Mr A. G. Somsen, Mr R. Souweine, Mr P.J. Spee, Mr J. Stadhouder, Ms J. Stockmann, Mr P. Stoffels, Mr W. Stolk, Ms A. van Straten, Mr G.T.A.M. Streng, Ms M. Struijk, Ms M. S端phke. T Mr A.H.J. Takkenberg, Mr M. Teeuw, Mr T. Tempelman, Mr R.E.M. de Tender, Mr L. Tepe, Mr M. Terpelle, Mr W. Tersteeg, Mr L.H. Thoma, Ms Y. van Tienen, Ms W. Tjiook, Mr W. Toeter, Mr E.E.M. Tollenaar, Mr A. Treuren, Mr E.K. van Tuinen, Mr J. Tuit, Mr R. Turkstra. U Mr F. Uijlenbroek. V Mr G.J.T.M. van Valkenhoef, Ms T. Veenink, Mr S. van der Veer, Mr B. Veldman, Mr J.A. Vellekoop, Mr R. Velstra, Ms I. Veltman, Mr J. Verhage, Ms J. Verhees, Ms C. Verhulst, Mr P. Verlaan, Mr A. Versluis, Mr J.H. Versteegen, Mr L.H. Vierhout, Mr J. Visscher, Mr C. Visser, Mr D. Visser, Ms M. Visser, Mr A. Vissers, Mr G.G. van Vliet, Ms K. van Vliet, Mr G.J. Voerman, Mr C.M.L. Voorburg, Mr G. Vosselman, Ms I. van de Vossenberg, Mr J. Vredegoor, Mr W. Vroom. W Ms L. Waaijman, Mr J. ter Wal, Mr J. Walter, Mr R. Waterman, Mr J. de Weert, Mr E.M. de Wekker, Mr J. de Wekker, Mr A. Wesdorp, Mr A.A. Wever, Mr G.J. Wieberdink, Mr W. van der Wijk, Mr C.J. Willeboordse, Mr R. Willemse, Mr R.P. van Wilpe, Mr T. Winkel, Mr P. de Wit, Mr A. de Wit, Mr J. Witteborg, Mr M. Woerden, Mr R. Wooning, Mr A.J. Woortman, Mr R. van der Woude, Mr J. Woudenberg, Mr Z. Woudenberg. Z Mr R. van Zitteren, Mr J. Zwanenburg. Design office ipv Delft offers the reader realistic insights into the bridge designing process. What exactly is involved? What knowledge is required? How much does a bridge actually cost? And how can you ensure that all the requisite factors â&#x20AC;&#x201C; technology, design requirements and desired image â&#x20AC;&#x201C; are combined to create a successful bridge design? 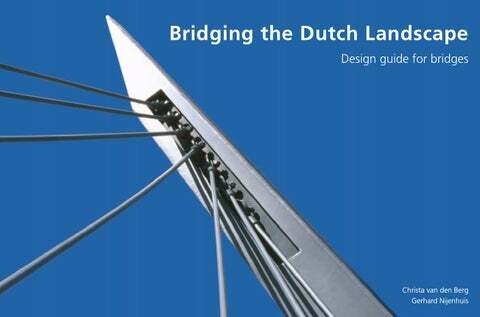 Bridging the Dutch Landscape tells the story of the design process, based on 26 bridge designs and a design guide. One by one, it shows the different parts of a bridge and their function and possibilities. Apart from interesting design features, factors such as the building costs and bridge size are included for each project. 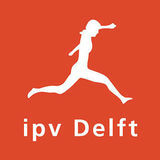 ipv Delft has been designing bridges and outdoor products for ten years. In the process, the company has gained a wealth of experience and has become an expert in bridge design and all that is involved in the design and building processes.